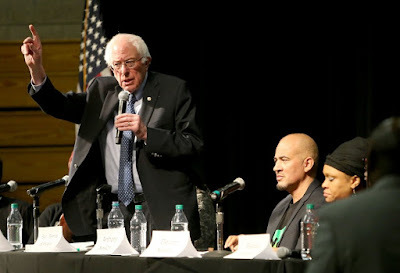 MINNEAPOLIS -- Sen. Bernie Sanders encountered some tough questions during a Black America forum last Friday night, when participants questioned the presidential contenders position on slave reparations for African-Americans. The forum was organized by the nonprofit Neighborhoods Organizing for Change. This wasn't one of Sanders common campaign occasions, where he answers a few quick questions with quick answers then splits. Activists had him cornered this time. Patrick Henry High School was crowded with voters and many of them were Black Lives Matter supporters and activists, who had eagerly been waiting to question the senator since his interview last month with Fusion reporter Nando Rodriguez-Villa. In that interview when asked does he support reparations he responded, "No...I don't think so." "I know you're afraid to say black, and I know you're afraid to say reparations..."
"Ma’am, I don't think that's a fair statement," Sanders interjected, but Perry continued her statement. ".....It seems like every time you talk about black people, and us getting something for the systemic oppression and exploitation of our people, we have to include every other person of color," she said, receiving a big applaud from the crowd. "You and I may disagree on this; It's not just black. It is Latino. There are areas of America, in poorer rural America, where it's white. So, I believe that in a country that has more income and wealth inequality than any other country, then yes, the time is overdue to invest." Sanders, continues to evade stating his position on whether he is for African-Americans receiving reparations for the forced free labor of their ancestor's, but insists that ,"we should invest most heavily in those communities most in need". Responding to panelist Roderick Adams, Sanders continues on giving his word and a guarantee that his campaign plans on creating 13 million jobs over the next five years while rebuilding infrastructure; and that the money will go into the communities that need it most to rebuild their own communities. How?... the audience screams How? Urging Sanders to be more specific, but he didn't have time to answer. Bernie Sanders stated in his Fusion interview that Congress would never authorize slave reparations. Why is that? Native American's received 3.4 billion from the Cobell settlement accusing the U.S. Department of Interior of failing to account for revenue from a trust fund representing the value of Native American land. If this is about failing to account for revenue, from the years of 1620 to 1865 African-Americans were forced against their own wills to labor for free. That's 245 years. If that's not failing to account for revenue, then what is? Jewish Holocaust survivors in America got $12 million; what about the Black Holocaust survivors here in America? The Jewish death toll was in the 6 million range within a estimated 12 year period of Hitlers command. Try putting a death toll on 500 years of Trans-Atlantic slave trade of blacks from Africa to the West. Yet blacks are still here in the U.S.A surviving. The Japanese-Americans received $20,000 each for having their property took and being incarcerated during WWII. That's about $40,000 now days. Blacks fought in the Civil War just to obtain freedom, only to be further disempowered by Jim Crow laws. I'm not down playing any of these disparities encountered by other racial groups. The point is, politicians like Bernie Sanders want to appeal to black voters and presume as if they are aware of social inequalities and injustices. They like to flirt with the idea of systematic oppression to bait blacks into their campaigns, but once a remedy attacking systematic oppression is proposed, they dance around it. That's when their argument devolves back to environment and general population. Yes, there are other racial groups living in poverty and there should be social economical reforms put in place for every impoverished community including; the black ones, but no one race group in this country is more impoverished and disenfranchised than blacks. 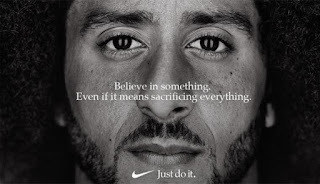 So, in terms of blacks you can't hold a conversation about systematic oppression or inequality without accepting the argument of reparations, because it is the root of black descendants of slaves in this countries social economical problems, the very foundation they need to sustain a economical presence. Creating more jobs for the impoverished and not rewarding some sort of reparations or sovereignty to blacks, only further lines the pockets of the white social economical class as well as other racial groups that come into this country with a group economical structure, while the black social economy continues to lack foundation. Majority of blacks will continue to work for white owned corporations, taking that money and buying groceries from white owned grocery store chains, who are supplied by white farmers and manufactures. These everyday transactions are the back bone of any social economical structure, and every racial group in America has a system of group economics except African-Americans. It's not that blacks can't do better because, many communities have risen and fell. The problem is simply the lack of a firm foundation to begin with.